Yet again the Pakistani batting failed to fire. This was not a convincing victory by any means. Yes, Pakistan won by 97 runs, but they were playing the Netherlands, an amateur European team with a very weak bowling attack. We saw what happened to the batsmen when they came up against Australia and England - they just collapsed. Our batting is not good enough to win the World Cup. It's as simple as that. 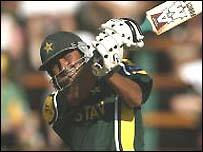 Why was Inzamam-ul-Haq not batting at three? Playing him at four was a mistake. And why was Younis Khan dropped? Younis is a batsman, like Inzamam and Yousuf Youhana, who has the right technique and ability to play long innings, building a solid platform for the rest of the team. The first three or four batsmen should be staying at the crease, scoring runs to give the rest of the team confidence and motivation. But that is just not happening. Another significant statistic was the 40 extras Pakistan gave away. Extras are part of the parcel of an attacking team's approach. The Australians often give plenty away, but they always get the right result. We gave away a lot of extras during the 1992 tournament in Australia, yet we still managed to win the World Cup. But 40 runs from a total of 156? That is verging on the unprofessional. Despite their lacklustre performance, I was delighted to see Wasim Akram claim his 500th one-day wicket. Without doubt, he is the best left-arm bowler in cricket's history. He has so much natural talent. The only bowler I have seen with the same instinct is former West Indies paceman Michael Holding. And yet Wasim has stayed at the top of his game for so many years, he is a hero and a role model to millions of Pakistanis.